Ten towns in southeast Brazil are suffering river pollution after a dam collapse at a mine nearly three weeks ago that killed 166 people and left 155 missing, presumed dead, according to officials. 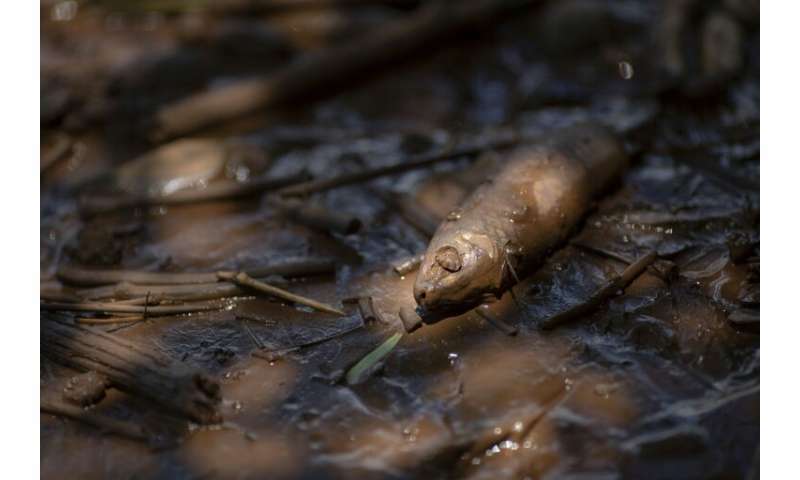 Mineral-laced sludge from the disaster near the town of Brumadinho has contaminated 75 miles (120 kilometers) of the Paraopeba river, impacting the riverside towns, the Institute for Water Management in the affected state of Minas Gerais (IGAM) said in a report. Officials have warned locals off using the river water for drinking, watering animals or irrigation. State environmental authorities had detected levels of toxic metals in the water, including lead and chromium, in the first 12 miles (20 kilometers) of the spill. IGAM director Marilia Carvalho de Melo was quoted by a local news website saying it was "unlikely" the waste would make it as far as a hydroelectric plant on the Sao Francisco river that the Paraopeba feeds into. The collapse of the dam in the mine owned by Brazilian mining giant Vale—the second in three years in the same region involving the company—released millions of tons of tailings, of mining waste. Most of those killed and missing were workers at the iron ore mine, many having lunch in the facility's cafeteria, in the shadow of the dam. Some nearby residents were also swept away and buried in thick mud. Emergency crews have been working daily to locate and recover bodies from the sludge. Their latest confirmed death toll of 166 given Wednesday was an increase of one over the previous count the day before. The number of missing, 155, was revised down from the previous tally of 160. Officials have said it is possible that not all the bodies of the missing will be recovered, making a definitive final toll difficult to establish. Vale, the world's biggest miner of iron ore, has seen a quarter of its stock market value wiped out since the disaster as investors weighed its liability, damage to its reputation and possible tougher industry regulations in Brazil.